hello, I am having an issue with possibly an older version of core running pistons that i cannot see or delete. The automation (turn on outside lights at sunset and off at sunrise ) is still running even though I have no pistons in the new version of webcore that I installed. I am not sure if I am posting in the correct location or not. Any help would be appreciated. Webcore is amazing and totally makes sense, just cannot figure out how automation is running that i cannot see in the webcore dashboard. Pull up the device from the ST classic app. When you get to the device details, look under the SmartApps tab and it should list all the apps using that device. Thank you for the help! I am pretty new to all this, trying to attached some pictures, hope this works! 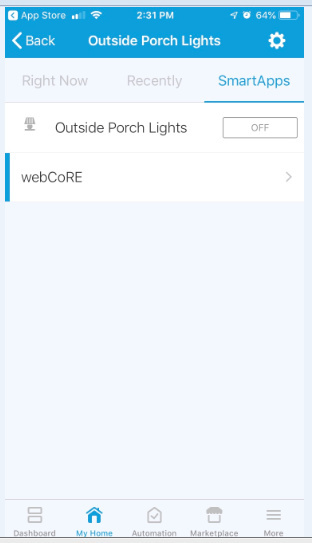 ok device details just shows webcore. and in webcore dashboard I dont have any pistons. yet, every day lights come on and off per the old piston. Any chance you created any Automations in the new app - STSC? Or any scenes? Well, thank you very much! I must have deleted the new STSC app off my phone because at the time it wasnt working correctly, but after reinstalling it did have automation on it. Hopefully deleting this will end my issues. I have been trying to figure this out for the past two months, thank you so much for the help! And sorry for inadvertently blaming an old version of core!